Plyometric training was originally developed to achieve more efficient and powerful movement patterns over and off the ground. Athletes were looking to run faster, jump higher and farther, and change direction more effectively, or in other words, negotiate the ground better. Jumps, bounds, hops, and their subvariations (skips, leaps, and ricochets) are all ways to maximize the ability to negotiate the ground and transfer forces effectively in athletic applications. Many definitions of jumping are used in discussions of training and evaluating athletic performance. In jumping, athletes seek maximal height (or in teaching terms, projecting the hips upward), but they may not emphasize horizontal distance. Although lead-up footwork can vary, athletes usually use both legs in takeoff and landing. Track and field literature refers to jumping as any action that involves taking off and landing on both feet. This is an excellent description, and although it does not fit all situations (e.g., the high jump), it shows another way of connecting training terms with performance terms. When jumping for height, the starting position and initiation methods have significant value. Squat jump – A jump performed without a pre-stretch movement. It is a vertical jump from a static position of ankle, knee, and hip flexion of specified degrees. Countermovement jump – A jump that includes a pre-stretch movement. It is a vertical jump following flexion of the ankle, knee, and hip joints and the subsequent extension of the briefly flexed musculoskeletal system. 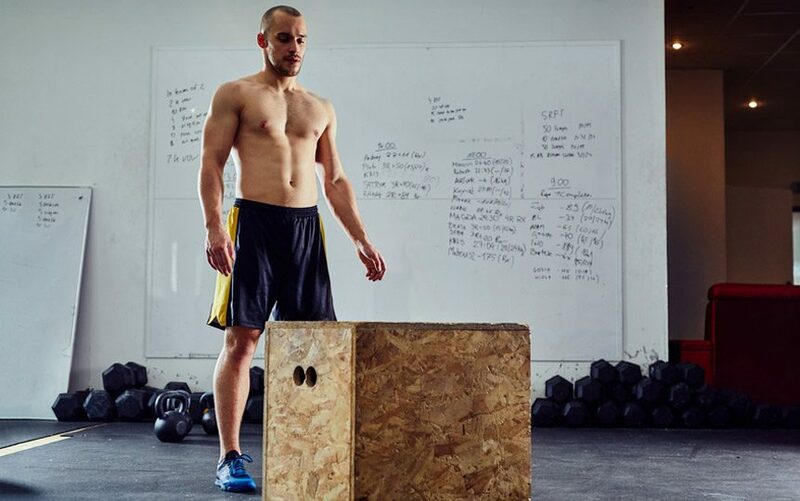 Drop jump – A vertical jump after landing from a drop of a specified height, the flexion or countering of the landing, and the following extension of that musculature. In-place jump – A jump in which the takeoff and landing do not involve horizontal travel. Only a vertical displacement of the body takes place. In-place jumps are usually reserved for beginning exercise progressions; in advanced programs they are used in low-intensity and moderate-volume work. Long jump – A jump used in track and field in which athletes travel horizontally. Takeoffs and landings are of low intensity and high volume, and jumps are recorded in meters rather than contacts (e.g., 30 to 100 meters). Meso-endurance jump – A low-impact, simple bounding, galloping, and combination jump designed for traveling long distances (40 to 80 meters). Takeoffs and landings are of low intensity and high volume. Meso-endurance jumps also are usually recorded in distances rather than contact repetitions. Meso-power jump – A jump that involves takeoffs and landings of high intensity and low volume (also from track and field). It involves boxes or alternating or single-leg contacts. Short-end jump – A jump that involves takeoffs and landings of low volume and highest (or shock) intensity. This jump involves a high degree of complexity and high impact (e.g., hurdle hop, depth jump, and standing triple jump). In the context of explosive training, the shock method was originally meant as a description of eccentric training. More specifically, though, it referred to the explosive–reactive methods involving impulsive types of training (such as depth jumping). The emphasis in bounding is to gain maximal horizontal distance; height is a factor in achieving distance. Athletes perform bounds either with both feet together or in alternate fashion. In track and field, bounding is any action that involves taking off from one leg and landing on the other. We agree with this definition from the standpoint of the advanced execution; however, early progressions of horizontal hip projection encourage double-leg takeoffs and landings to maintain low stress and emphasize high technical value. Therefore, we place bounding alterations in this category (e.g., prancing, galloping, and skipping) for the purposes of teaching and learning progressively. The primary emphasis in hopping is achieving height or distance with a maximal rate of cyclic leg movement. Gaining horizontal distance is of secondary importance early in training, to emphasize the value of the hip projection that accompanies optimal cyclic leg action. Later, de-emphasizing the vertical aspect may become important to accomplish more specific goals (e.g., the hop phase of the competitive triple jump). In track and field, hopping is described as an action that involves taking off and landing with the same leg. This term is agreeable with respect to the teaching and performance progression. Because of the complexity of hops, early progressions focus on the balance and postural stability required when using both legs for good hip projection and cyclic leg action, regardless of the direction (forward, lateral, or backward). Leaping is a single-effort exercise that emphasizes maximal height and horizontal distance. Athletes perform leaps with either one leg or both legs. Leaping is another description of movements similar to jumping and bounding, usually a single-repetition (nonrepeatable) response. Athletes perform skipping by alternating a step-hop on the right and then a step-hop on the left, emphasizing height and horizontal distance. This step-hop method can be applied in all directions (forward, lateral, and backward). The emphasis in a ricochet is solely on the rapid rate of leg and foot movement. The athlete minimizes vertical and horizontal distance to allow a higher (faster) rate of execution. The plyometric exercises, like many other exercise methodologies, fall under two developmental categories: loading (or resisted) and unloading (or assisted). Ricochets done with the proper feeling of falling can fit into the latter category; some call this the overspeed style of training. This article was excerpted from High Power Plyometrics, by James Radcliffe and Robert Farentinos. For more information on the second edition of High-Powered Plyometrics or other strength and conditioning books and resources, visit HumanKinetics.com. 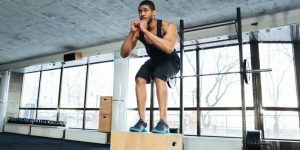 5 Factors: Is Plyometric Training Right For Your Program?